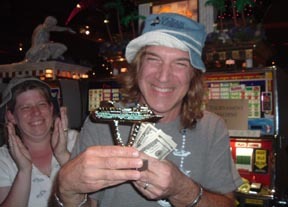 Dave was the big winner at the Slot Tournament on the Cruise. 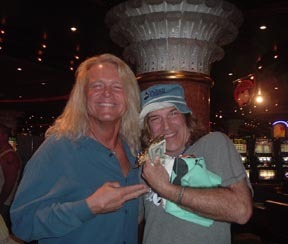 Look at that cash, and a trophy with the ship on it! Oh, braggin' rights go with the trophy. 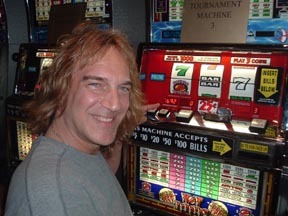 Congratulations Dave! 12/14/04 You might think that being off the road, Dave would be taking it easy. No way! 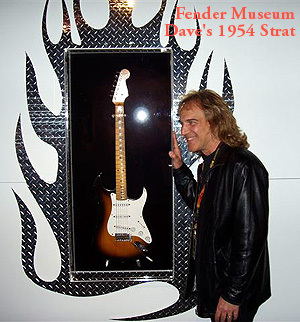 Recently Dave attended the opening of the new Fender Museum in Corona, California. Dave loaned to Fender, four of his vintage Stratocasters for display. These guitars are his 1954 Sunburst Strat, 1955 Custom Color Coral Pink Strat, 1958 Strat in Desert Sand, and his 1964 Start in Olympic White. The guitars are on a six month loan. 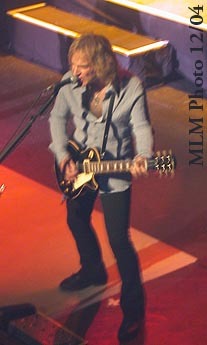 Dave's Custom Shop guitar builder and buddy Ronee Pena served as Dave's host. 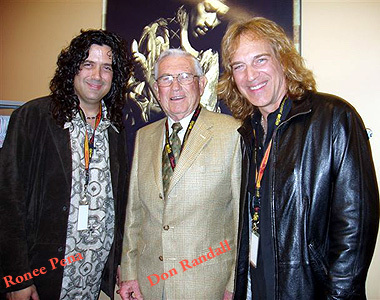 Dave had the pleasure of meeting several people who are prominent in the history of Fender guitars. 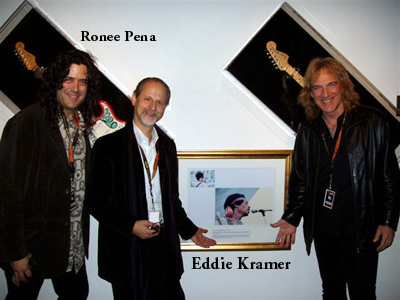 Two of those, pictured above are Don Randall who named the Stratocaster and Telecaster guitars, and Eddie Kramer: famed producer to Jimi Hendrix (Led Zep, KISS, Stones and others.) 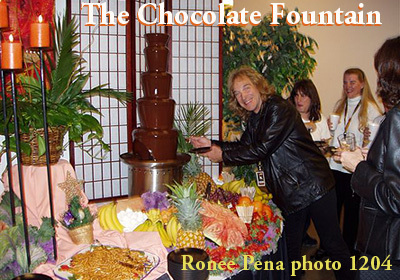 Many thanks to Ronee Pena for sending photos and details. To see more, go to www.fendermuseum.com. To learn more about Mr. Kramer, visit www.kramerarchives.com.